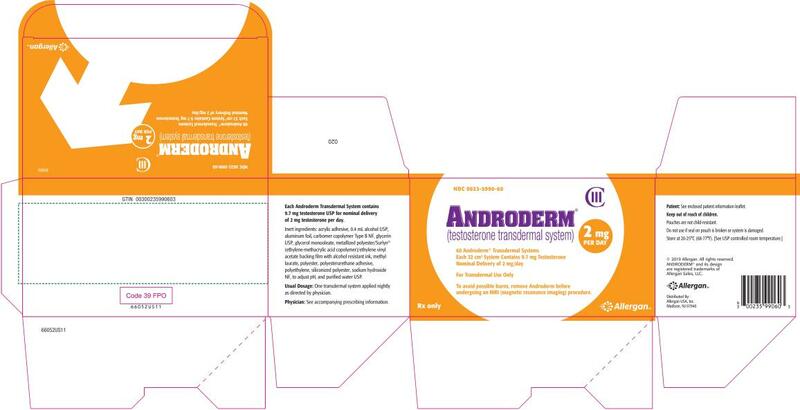 ANDRODERM is contraindicated during pregnancy or in women who may become pregnant [see Contraindications (4)]. 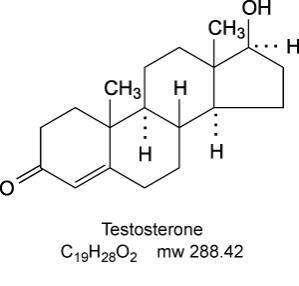 Testosterone is teratogenic and may cause fetal harm. Exposure of a female fetus to androgens may result in varying degrees of virilization. If this drug is used during pregnancy, or if the patient becomes pregnant while taking this drug, the patient should be apprised of the potential hazard to a fetus. 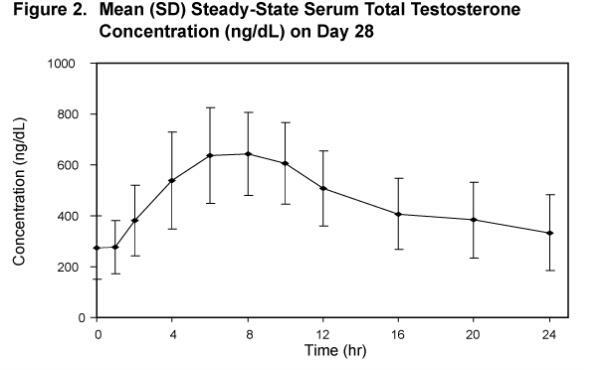 ANDRODERM 2 mg/day and 4 mg/day were studied in a trial designed to evaluate the use and titration of 2 mg/day and 4 mg/day systems in a clinic setting of 40 men with hypogonadism. Thirty-eight of the 40 subjects (95%) who were enrolled into the study were white and 2 subjects were African American. Ten (25%) subjects were Hispanic and 30 (75%) were Non-Hispanic. 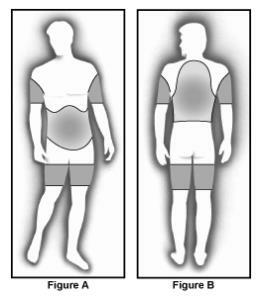 Men were between 34 and 76 years of age (mean: 55 years). Patients had previously been on stable therapy of ANDRODERM 5 mg; Androgel® 2.5 grams, 5 grams, 7.5 grams or 10 grams; or Testim® 2.5 grams or 5 grams daily before switching to ANDRODERM 4 mg/day. 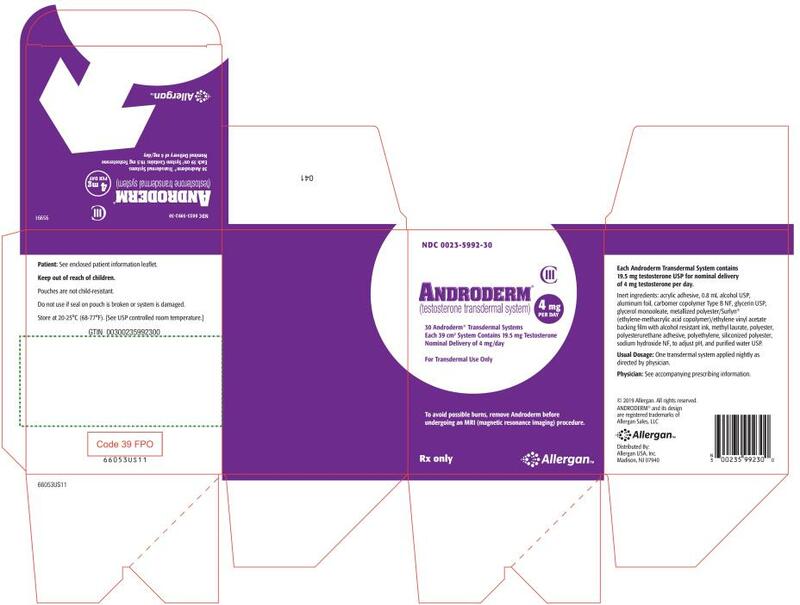 ANDRODERM® is a registered trademark of Allergan Sales, LLC. ○ If your ANDRODERM patch falls off before noon, put on a new ANDRODERM patch and wear it until you put on a new ANDRODERM patch at your regular time. ○ If your ANDRODERM patch falls off after noon, do not put on a new one. Wait and apply your ANDRODERM patch at your regular time. For more information, go to www.androderm.com or call 1-800-678-1605. If you have questions or concerns about your ANDRODERM treatment, ask your healthcare provider or pharmacist.